(13 reviews) Write a review! Dexterity, Putter Length will change. 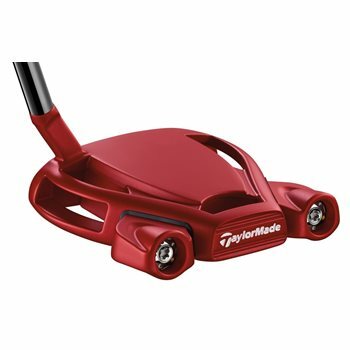 The TaylorMade Spider Tour Red putter was specially designed for Jason Day, and now you too can use this premium and precise putter to shave some strokes off of your score. Redesigned with a smooth crown and no sight-line, the alignment system is clean and seamless. A short slant neck hosel, rarely found on high-MOI mallets, provide the player with expanded visibility of the face and toe hang. The Spider Tour Red has a softer sound and feel than the Spider Tour Black, but both feature a lightweight body and stainless steel frame to increase MOI. The vibration-dampening PU foam provides a consistent sound and feel for every putt you take. Displaying 8 out of 8 Questions. The face and insert are the same in the two putters. why does this not come with a head cover as a new club? A new putter will come with a head cover. The listing is incorrect for the new putter. The head weight of the Spider Tour Red is 355 grams. What is the difference between the red and the tour spider? The Spider Tour Red features an all black, straight shaft with a short slant neck hosel while the Spider tour features a double bend shaft. Also, the Tour Red has no sightlines while the Tour has a long sightline on the top of the clubhead. Can the weight balance **** be interchangeable with various wights and are they supplied? Just trying to understand the $80 difference in the $219 Spider. The absence of the sight line seems to be a disadvantage rather than an advantage to me. The putter does not come with additional weights. It was designed for Jason Day who preferred the lack of sight lines and the short slant hosel to improve the visibility over the ball. It also features a softer insert resulting in a much softer feel when putting. Is the Spider Tour Red putter face balanced? Yes, the Spider Tour Red putter face is balanced. It is not face balanced. Does this putter come with the Red headcover or Black? The Spider Tour Red comes with a red headcover. Note headcovers are included with new putters only. Great product! However was too long for me so had to return it. The comments listed above by your PGA golf professional, Rudi Fann, are incorrect. The face/insert are not the same as it concerns the red and the black inserts on the Spider Tour. The red insert is the softer of the two inserts. Love my new putter, great feel. switched back to a mallet after flirting with a blade Scotty. In my most recent round already made some puts I was missing with the blade. Love the way it rolls the ball instead of the ball skipping at first like a lot of putters. The ball rolls out further.